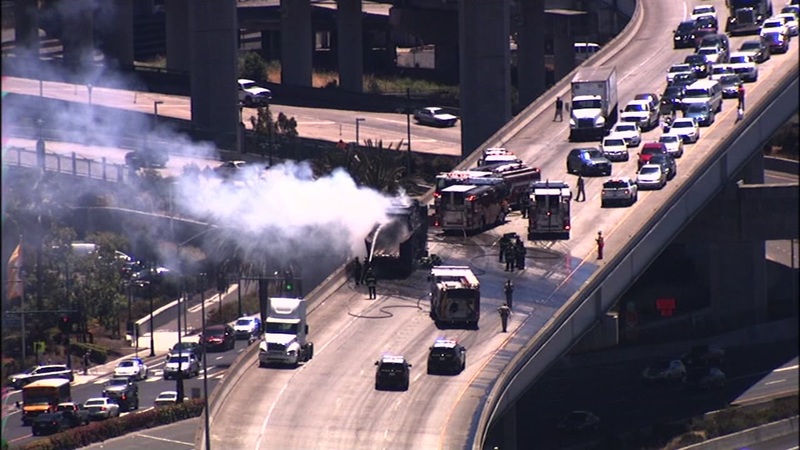 EMERYVILLE, Calif. (KGO) -- A critical freeway connector through the Bay Bridge maze that's usually packed with drivers was closed for nearly eight hours because of a big-rig fire. A hazmat crew worked to clean up materials spilled by the truck on the northbound Interstate 880 ramp that connects to eastbound Interstate 80. The fire started at 1 p.m. Friday on the on-ramp near the Emeryville Ikea and one lane of traffic reopened around 7:30 p.m. Drivers passed by slowly. But CHP officials eventually shut down the on-ramp.